Objective: To further elucidate the structural basis of non-albuminuric renal insufficiency in patients with type 2 diabetes, we compared renal biopsy findings, including the measurement of mesangial area, in patients with type 2 diabetes and reduced renal function (CKD Stage 3) and varying degrees of albumin excretion. Research Design and Methods: In patients with normo- (n=8) or microalbuminuria (n= 6), renal biopsies were performed according to a research protocol. In patients with macroalbuminuria (n=17), biopsies were performed according to clinical indication. Tissue for light microscopy and electron microscopy was prepared using standard techniques. Electron microscopic (EM) assessment included quantitation of glomerular basement membrane thickness and mesangial area (by computer-assisted measurement using Digimizer (v4.2.2) image analysis software (MedCalc Software, Ostend, Belgium) in a subgroup of patients in whom this was available. Mesangial area was obtained using an on-screen drawing tool to define the boundaries of each mesangial area. The mean mesangial area in a glomerulus per subject was calculated. 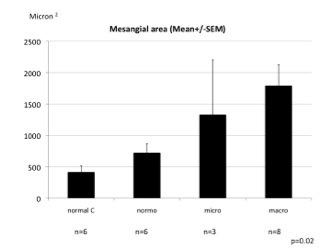 The normal range of mesangial area was calculated from examination of non-diabetic control subjects in whom biopsies were performed for clinical reasons and showed qualitatively normal mesangium. Results:In our study population (mean eGFR35 ml/min/1.73m2), typical glomerular changes (C2) of DN were observed in 22/23 subjects with micro- or macro-albuminuria compared with 3/8 subjects with normoalbuminuria(p = 0.002). By contrast, predominantly interstitial or vascular changes (C3) were seen in only 1/23 subjects with micro- or macroalbuminuria compared to 3/8 in normoalbuminuric subjects(p = 0.08). Mesangial area increased progressively from normal controls to patients with type 2 diabetes and normo-, micro- and macroalbuminuria (Figure). Conclusions: Typical renal structural changes of diabetic nephropathy were observed in patients with type 2 diabetes and elevated albuminuria. By contrast, in normoalbuminuric renal insufficiency, these changes were seen less frequently, likely reflecting greater contributions from ageing, hypertension and arteriosclerosis.